Alright, first and foremost let's get the most important detail out of the way. Season three of The Mindy Project debuts on September 16th. Get out your calendar and mark the date right now, before you read any further. Ok, now that mission one is complete, let's move onto the fashion news element here. Don't worry - no spoilers involved. Mindy Kaling took to Instagram this evening to share a fashion moment with the world. If you aren't watching Kaling as a trend leader, you are behind already. Her fashion, both off and on set, is worth noting and imitating. Case in point - her latest share. 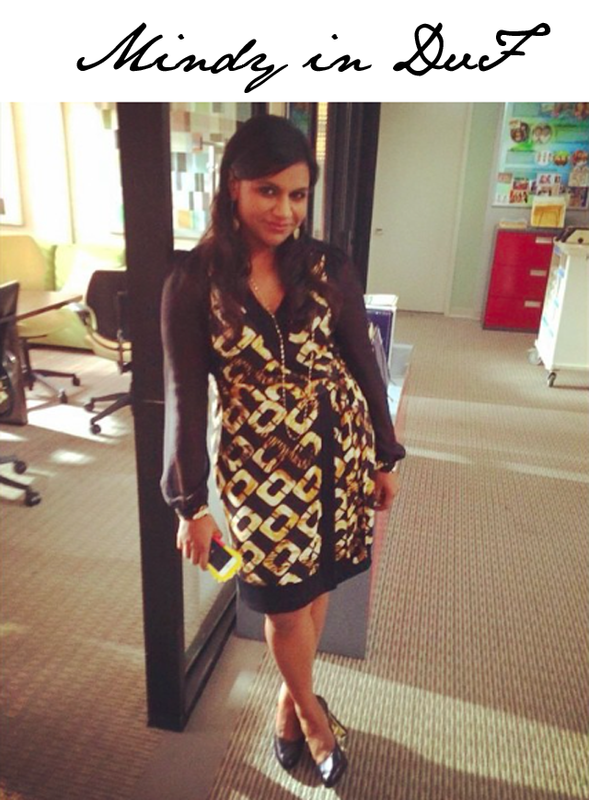 Mindy is pictured above wearing a wrap dress from Diane von Furstenberg. Seems Mindy was never sold on the designer or wrap dresses for her figure before this moment. Let that be a lesson to us all. DvF is a brand for EVERY woman. Ask any lucky lady who has a wrap dress or two in their closets and they'll tell you that the first purchase was life changing. So now that Mindy's all in love with Diane von Furstenberg, does this mean we can expect to see many more wrap dresses in future episodes of The Mindy Project?